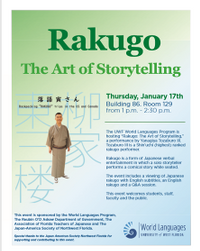 The UWF World Languages Program is hosting "Rakugo: The Art of Storytelling" a performance by Yanagiya Tozaburo III. Rakugo is a form of Japanese verbal entertainment in which a solo storyteller performs a comical story while seated. The event is a form of Japanese rakugo with English subtitles, an English rakugo, and a Q&A session. This event is held in the building 86 Room 129.